Find My Workspace lists over 95% of the business centres market in Barnsley. Simply click Request Quote to check pricing for one office, or Add to Basket for multiple offices. Regardless of the size of your company, this is the perfect place to do business, with offices with 1-24 workstations, providing a supportive community of innovative entrepreneurs. If you are not quite ready to take an office, there is always shared space available. There is also a range of virtual office packages available to help you get your business off to a flying start. Our shared office facility is available to let from £140 per month, whilst conventional options are rented from £20 per sq ft, includes rent,business rates, utilities, service charges, common area cleaning, security, waste disposal, staffed reception (call and mail handling), site management, buildings insurance, 24/7 access, easy in, easy out terms and on site business support (if required). The centre provides a range of high quality and well equipped meeting and conference facilities, perfect for all your business meetings. Full hospitality packages are available. This centre is a shared, fully managed facility providing an extensive range of business support services to innovative, knowledge-based or technology-based businesses. Tenant companies enjoy the freedom to carry out their day-to-day business activities without the added burden of having to source a wide range of business support services. All support services are provided on-site, together with free car parking for your employees and visitors. For small businesses that require all of the services of a virtual tenancy, but also wish to use the co-working space on an occasional basis, then we offer a hot desk tenancy. This provides you with use of a workstation for up to four days per month, with the opportunity to rent extra days at a very cost-effective rate. On offer is ‘easy-in, easy-out’ shared office space for clients wishing to take the first step into an affordable office based environment. Two meeting rooms are available accommodating 6 and 25 people respectively. All offices benefit from thermostatically air conditioning/heating and are finished to a high specification. Furnished with modern furniture, a striking reception and professional on site staff, the office building provides its occupants with a highly professional image. All accommodation is offered on “all inclusive” agreements. By offering transparent terms and tailor made packages This centre are confident they can provide the right solution for you to join the 50+ local, regional and national businesses who are already proud to be based at this centre. This centre offers a unique experience to spend your workday in a piece of history. Based in a 19th century quilt factory, this centre has been rebirthed as contemporary office space. Covering five floors, these spectacular suites are bright and spacious and have been recently refurbished. 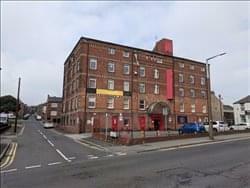 With Barnsley experiencing a boom of regeneration at this time, the opportunity to set up home in this historic building should be enticing for any business or brand looking to grow. This centre boasts a number of amenities, with the highlight being full concierge and reception service for all tenants. The concierge service will collect and distribute all mail to take the burden off tenants. Tenants can also access the centre outside of office hours, and benefit from a wealth of parking nearby.